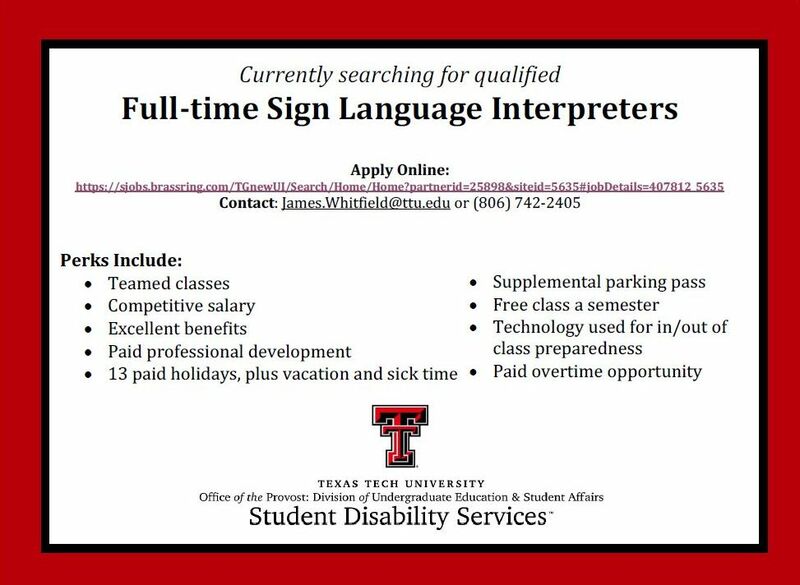 Texas Tech University, Student Disability Services Office is currently searching for a full-time Sign Language Interpreter to be a part of our department. This position will collaborate with the Assistant Director/Coordinator of Interpreting Services to provide accommodations for the Deaf and Hard of Hearing students in all aspects of their academic career. The Sign Language Interpreter position will be a full-time, 40 hour a week paid position with all benefits; as well as teamed classes, technology, free classes and paid professional development. This position will have occasional required night and weekend work paid as overtime. Compensation is determined by experience, education and certification. The link can be accessed below for position details on the Texas Tech University’s career website. 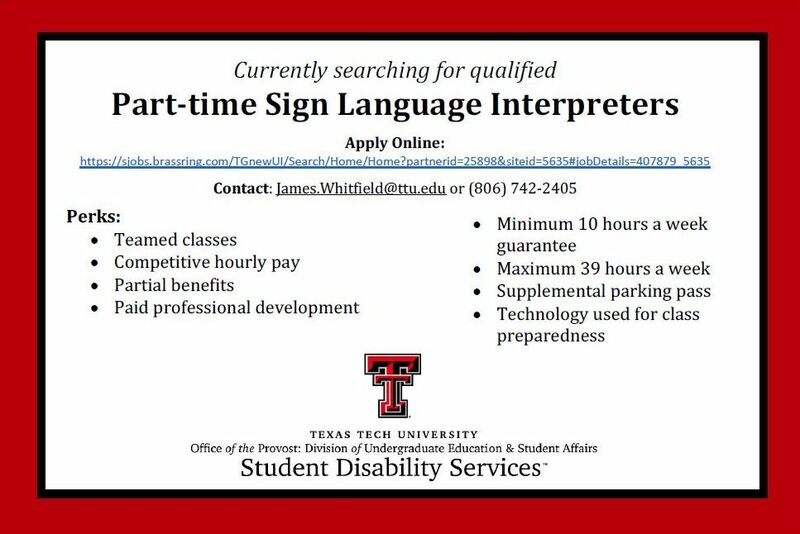 Texas Tech University, Student Disability Services Office is currently searching for a part-time Sign Language Interpreter to be a part of our department. This position will collaborate with the Assistant Director/Coordinator of Interpreting Services to provide accommodations for the Deaf and Hard of Hearing students in all aspects of their academic career. The part-time Sign Language Interpreter position will have a minimum guarantee of 10 hours per week from August to May (excluding campus closure/holidays) and a maximum of 39 hours per week; also includes teamed classes, technology, parking privileges and paid professional development. This position will be responsible for day, night and weekend interpreting assignments. The position’s hourly rate is determined by experience, education and certification. The link can be accessed below for position details on the Texas Tech University’s career website. Please contact Assistant Director, James Whitfield by email at [email protected] or phone at (806) 742.2405 for further details. James H. Whitfield, Jr., M.A.